‘Rebirth’ is an exhibition perfectly timed for the new year. Now on at the Royal Academy of Arts, Burlington Gardens, until 17 February 2013, this subtle, yet massive, exhibition is highly recommended to get your 2013 started with a cosmic bang! Mariko Mori’s first major exhibition in London for 14 years, Rebirth’s ‘core theme of the cycle of life and rebirth’ is refreshingly easy to access and well worth lingering over. Being a casual exhibition visitor, keen on installations, and with a penchant for Eastern philosophy, I was drawn to this exhibition like a charmed moth. ‘Rebirth’ captures the essence of so many elemental truths and seeming dichotomies; The New York Times describes it as ‘a seamless mix of technology and aesthetics, of science and philosophy, of Japanese artistic tradition and Western art history, of pop culture and spiritual practice’. Quite. The key piece of the show is the celebrated Tom Na H-lu II. This immense glass structure is illuminated by LED lights and is linked to Kamioka Observatory’s computer which records the emission of energy from supernovas – the explosion of stars. Exquisitely simple, yet breathtakingly intertwined with scientific measurement, its visual and spiritual power is astounding. It is difficult to resist the urge to hug this indescribably appealing monolith. Similar paradoxes abound throughout the exhibition. On one hand, it is simple. 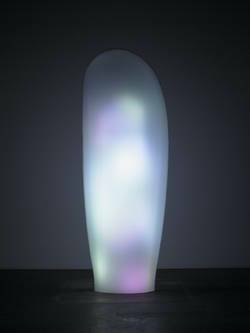 Luminescent, smoothly organic forms take centre stage. Circles and globes are conspicuous. Meticulously executed sparkly drawings and pictures are dotted all around. Many materials are used (acrylic, paper, stones, crystals, sound), illustrating the artist’s diversity. Yet each individual work develops under observation. Glows. Comes alive! On the other hand, the forms appear perfect; yet are organic and asymmetrical. Some appear natural; yet are made of modern man-made materials. Rooted in Mori’s contemplative and meditative approach to life and art, the works reflect her vision of ‘the floating world’ and all that is transitory yet everlasting. Somehow, trying to describe energy in the vision of ‘Rebirth’ in words is like trying to tickle a bubble with a pin. Just go and see it. And if you if can’t get enough of it, like me, try the Japan Society’s ‘Curating Mariko Mori’s ‘Rebirth’ – with Kathleen Soriano on 21 January, RA’s ‘In Conversation – Mariko Mori and Professor Brian Cox: Art meets Science’ on Friday 8 February, or the RA’s family studio ‘Out of Space’ to ‘create a stellar mobile and see it glow in our UV workshop’. Visit the RA website for more info and a video intro to the exhibition.